Welcome to the Department of Public Works, located at 38 East Avenue. Our Staff includes Harry Donahue, Superintend of Public Works, David Moore, Labor Foreman, and Carol McNees, part time clerk. We also have a mechanic to service and maintain all of our equipment, and 8 DPW laborers. The Department also has 1 laborer and 1 meter reader in our Water Department. 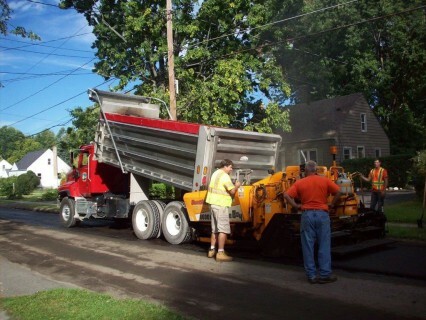 The Department of Public Works is responsible for upgrading, repairing, and maintaining the village's infrastructure, from its water lines to its sanitary and storm sewers and cleaning catch basins twice a year. We maintain village streets and sidewalks in all seasons, plant and prune village trees, and do fall leaf pickup. We maintain all of the village's buildings' interiors and exteriors. We pick up brush twice year, and sweep village streets during the warmer months. We read water meters, flush water hydrants and mow and maintain the village's 9 parks. DPW no longer picks up large discarded household items in the spring. Call your garbage/trash hauler for this service. If you have questions or concerns, please call the Department of Public Works at (585) 637-1060 Monday – Friday between 7:00 AM and 3:30 PM. Need to Dispose of Brush? The DPW offers the use of our trucks over night for our village residents to fill with brush, tree cuttings, etc. We drop off after 3:00 PM and pick up the next morning after 7:00 AM. If you know you need more than one evening to fill the truck, reserve on a Friday and have till Monday. Please call 637-1060 to arrange a delivery to your driveway. Notice a Street Light Out? If you notice a street light out, contact the DPW at 637-1060 and we will report it to National Grid. If possible, please provide the pole number, and if the light is out or cycling.